The London Marathon is a British institution which has taken place every year since 1981. With more than 40,000 runners expected to leave the start line, this year’s race will be held on Sunday 28th April. Run over 26 miles and 385 yards (the standard established by the International Association of Athletics Federations), it is one of the top six marathons in the world. Entrants include serious elite runners, including disabled athletes, celebrities, ordinary members of the public and plenty of competitors in fancy dress, who run over a mainly flat course around the River Thames. The race was founded by the former Olympic track and field athlete Chris Brasher and the Welsh 3,000-metre steeplechase runner John Disley. They were regulars in a pub next to Richmond Park, The Dysart Arms, which was the base of Ranelagh Harriers running club. Every Wednesday evening, the runners would pop in for a drink and chat about the New York Marathon, with its buzzing atmosphere and enthusiastic spectators, who cheered everyone to the finish line. Some members of the Ranelagh Harriers had taken part in the New York Marathon in 1978 and marvelled at how different it was from marathons in the UK. At the time, most marathons in Britain took place around rural lanes and there were relatively few spectators. Brasher and Disley were spurred into entering the 1979 New York Marathon and trained hard for the event. Brasher was unsure about running the marathon, since it was a gruelling course, but the duo both finished the race, running past world-famous landmark sights and animated, cheering spectators. They found the race and the camaraderie of the runners exhilarating. Brasher, a journalist in later life, wrote an editorial in The Observer in which he described the event as “the world’s most human race”. They wondered if London could stage a similar event, so after discussions with the Amateur Athletics Association, the police, the Greater London Council, the City of London and the London Tourist Board, they designed a course that took in many landmarks. The route took in Buckingham Palace, Tower Bridge, Big Ben, the Cutty Sark, the Docks and the Embankment. The police approved the race and hence the London Marathon was born. A stumbling block was the cost of staging the event, as permission had been given on condition it was self-funding, with no cost to the ratepayers, but sponsorship was gained from Gillette and it was granted charitable status. Brasher and Disley detailed their aims for the London Marathon, which included raising funds for sporting and recreational facilities and improving the standards of British marathon running by attracting international competition and providing a fast course. It was also aimed at boosting tourism in London and proving Britain was best when it came to organising major sporting events, but above all, they wanted the participants to enjoy themselves, with a sense of happiness and achievement in a troubled world. Over the years, the London Marathon has grown in numbers and stature and has won massive public support. As a charity sporting event, it is unparalleled and has raised millions of pounds for worthy causes, as one-third of places are offered by charitable organisations. The event has its own official charities, but runners can raise money for their own causes. Today, more than 750 British charities offer a total of 15,000 guaranteed places for runners. In 2007, the London Marathon broke the Guinness world record by raising £46.5 million for good causes, as it was the world’s largest annual single fundraising event. Every year since, the record has been broken again. More than £830 million in total has been raised for charities since 1981. On top of this, the company that organises the race, London Marathon Events Ltd, has raised more than £64.5 million for its own charity, The London Marathon Charitable Trust. Beneficiaries over the years have included the Sports Aid Foundation, Middlesex Hospital Research Fund, the British Sports Association for the Disabled, the Wishing Well Appeal, the Battle of Britain Appeal, Action on Addiction, the NSPCC, the British Heart Foundation, the National Asthma Campaign and many more. Now sponsored by Virgin, the event is known as the Virgin Money London Marathon. There are cash prizes for the winners in various categories. Winners of the men’s and women’s elite categories each receive £39,000. Each runner-up gets £22,000, third place receives £16,000 and fourth place £10,500. In addition, £70,000 is set aside to be divided between any runners in the men’s race who complete the marathon in less than two hours and five minutes, and any women who run it in less than two hours 18 minutes. Any competitor who sets a new course record will receive £17,600. The men’s record is two hours three minutes and five seconds, and the women’s record is two hours 17 minutes and 42 seconds. The men’s and women’s winners of the wheelchair races each receive £17,600. Total prize money divided between all the victorious wheelchair competitors is £100,260. London Marathon 2018 was launched by Queen Elizabeth II from the grounds of Windsor Castle. The elite men’s winner was Kenyan runner Eliud Kipchoge, winning his third London Marathon. The elite women’s winner was Vivian Cheruiyot, also of Kenya. The men’s elite runner-up was Ethiopian Tola Kitata. Britain’s Mo Farah was third, finishing two minutes and five seconds behind Kipchoge. Setting a new British record, Farah finished in two hours, six minutes and 32 seconds. Madison de Rozario won the women’s elite wheelchair race and British athlete David Weir won the men’s wheelchair race for the eighth time. Every year, the London Marathon attracts a host of celebrity runners. The 2018 competitors included TV personality and model Katie Price, DJ and television presenter Chris Evans, celebrity chef Gordon Ramsay, American actress Caitriona Balfe, Welsh actress Eve Myles and Great British Bake Off star Selasi Gbormittah. Ramsay has run ten consecutive London Marathons. He has also run other 26.2-mile marathons at locations worldwide, including Los Angeles and Edinburgh. There was also a team of fellow Great British Bake Off stars in 2018, including Jane Beedle and Chetna Makan, who were running under the name, the Baker’s Dozen. All of the celebrities were running in aid of their chosen charities. Details of who’s running in the 2019 London Marathon will be revealed nearer the time. 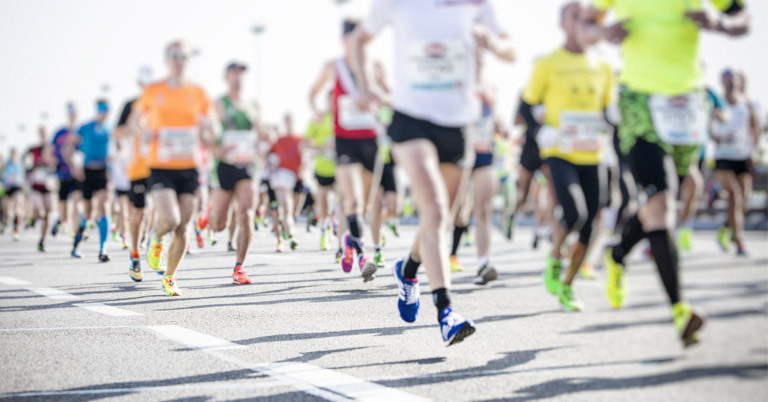 If you’re planning to visit the capital for the London Marathon 2019, why not hire a minibus from H&H Van Hire? London minibus hire is popular for groups of travellers, as it enables everyone to arrive together, without the hassle and expense of taking individual vehicles. Please contact us for further details of how to book our modern nine, 14 and 17-seater minibuses.